Low running costs – The ultra-efficient triple layer ShoreSeal™ insulation system incorporating Re-Heat™ heat recovery technology - one of the most energy efficient hot tub on the market. It also makes it the quietest. Low Maintenance – Shoreclean filtration system with Shoreclear Philips UV Treatment and WeatherGuard™ easy clean cabinet. 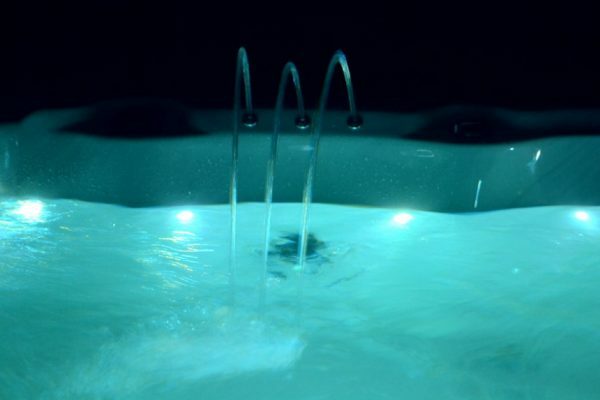 Long Warranties – Shoreline Hydrotherapy™ Hot tubs are robust, strong and long-lasting. This is reinforced by the unrivalled warranties that come with every Shoreline™ hot tub. Effective Hydrotherapy, Aromatherapy, Chromatherapy and the ultimate in hydromassage & relaxation. 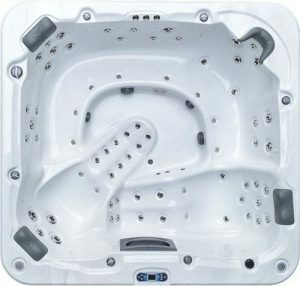 The Capri hot tub is a large family hot tub, comprises of 6 seats including 1 full body sculptured lounger. The Capri also has a lazyboy seat. This seat provides the benefits of a lounger, having calf jets but does not take up the space of a full body lounger. There is also seat with a moulded neck and shoulder hydro massager. *Delivery to Mainland England & Wales (subject to terms). Please note, we only deliver to Mainland England and Wales. 4 Pumps – Whispercirc® high quality quiet running low energy circulation pump, 2 Whisperhiflo® hydrotherapy boost pumps and Geezer™ hydrotherapy massage pump. 0% finance available – Choose 1 – 5 years Interest Free Credit (subject to status) on this model. 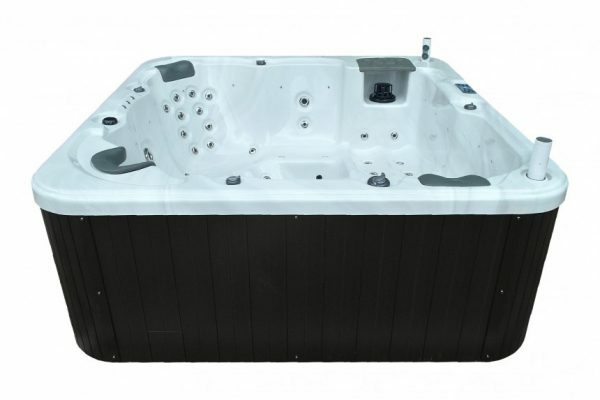 6 Seats – The Capri is a large 6 seater family hot tub, comprising of 5 seats, 1 full body sculptured lounger and a “lazy-boy” seat. This provides the benefits of a lounger, having calf jets but does not take up the space of a full body lounger. 3 Massage Controllers – personalise your massage by controlling the power through the various jets. 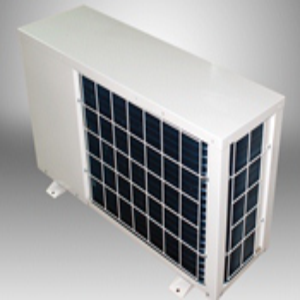 32 amp Supply – This model requires a 32 amp dedicated RCD protected supply. 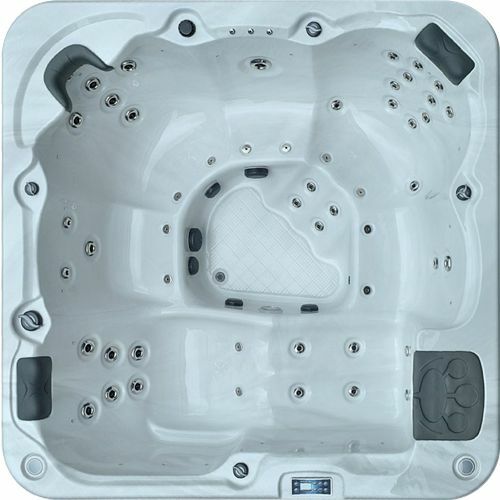 1 Power Diverter – direct the power across the hot tub and therefore maximise the massage experience. ShoreSense™ built-in aromatherapy system. An extensive range of fragranced aromatherapy beads are available to purchase. Exterior Drain – This model is fitted with an easy to access drain, complete with a Hozelock adaptor. 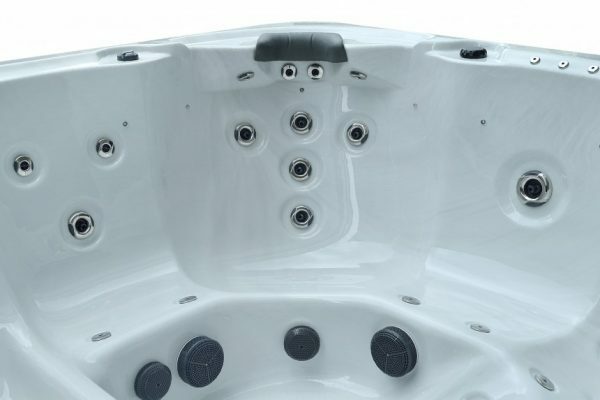 Ergonomic Design – All Shoreline™ hot tubs are designed with comfort as the overriding criteria. Careful application in the science of ergonomics has been employed in the design of the seating positions, heights and reclining rakes etc. and taking into account different customers heights and sizes we believe we offer the most comfortable relaxing hot tub seating available on the market. Fountains – 3 x stainless steel water fountains with controllable valve. Pump 1 – Whispercirc® high quality quiet running low energy circulation pump. Pump 2 – Whisperhiflo® hydrotherapy massage boost pump. 230-260 gallons per minute. Pump 3 – Whisperhiflo® hydrotherapy massage boost pump. 230-260 gallons per minute. Pump 4 – Geezer™ hydrotherapy massage pump. 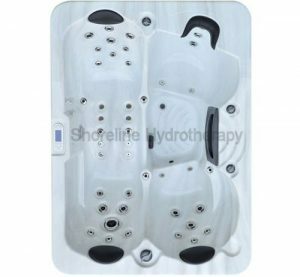 Hydrotherapy Massage Jets – HydroPro™ stainless steel hydro-massage jets. HydroMax™ (optional) – Hydro-Max™ is an optional enhanced hydrotherapy massage system developed by and exclusive to Shoreline hot tubs. It uses a special system, which introduces billions of tiny warm air bubbles into the water, making your skin tingle and helping to rejuvenate your body and mind. Talk to us about adding this optional extra to your hot tub before ordering. Hi Flow Plumbing – The hydrotherapy pumps are located closer to the jets. This shortens the pipe runs and therefore maximises power. 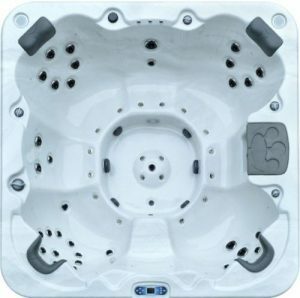 Unlike competitors hot tubs, where pumps are located along one side (usually under the keypad). Also incoporated is Hiflo® large bore pipework. Gradually swept bends further improves flow and performance. LED Perimeter Lighting – ShoreLight™ low energy multicoloured LED light with perimeter LED lighting. The ultra efficient ShoreSeal™ triple layer insulation system incorporating Re-Heat™,a unique 3 Stage Insulation System. ShoreCast™ Lucite™ acrylic shell with Microban™. Ergonomic in design. Strong, Durable, High Lustre Finish Lifetime Warranty*. Re-Heat™ technology is an efficient process, which re-cycles the heat generated by the pumps and equipment. The Heatlok™ 523 cover is the most effective heat retentive cover on the market. 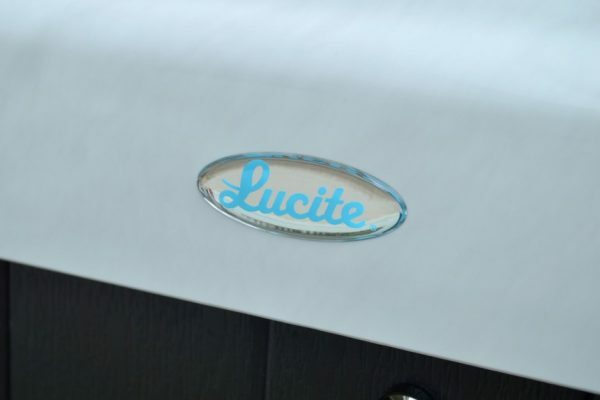 Fitted with a continuously insulated hinge and safety locks. Programmable ShoreClean™ micro filtration system. Control System – ShoreSet™ Self-Diagnostic System. Easy To Use. Programmable. ShoreFloor™ is an ABS sealed and insulated base. Tough, rodent/moisture proof. ShoreClean™ Corona Discharge Ozone Generator Complete with Mezzei® Injector fitted as standard. ShoreClear™ Philips® Bulb UV– For even lower maintenance, the ShoreClear™ Philips® Bulb UV water treatment is included with this model. ShoreSound™ bluetooth premium sound system with pop-up waterproof speakers and subwoofer. Support System – ShoreSupport™ stainless steel cradle system underneath the reinforced acrylic shell. 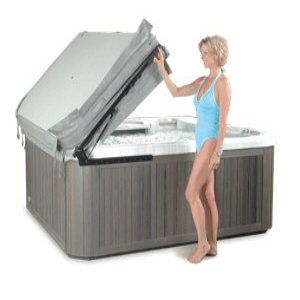 Shoreline™ hot tubs do not rely on lesser expensive ABS or soft wooden supports.